A street that runs west of Center City in broken sections from South Philadelphia to Strawberry Mansion is named after a Supreme Court justice who wrote an infamous opinion affirming slaves as inferior. A Temple student wants to change that. George Basile, a rising senior and political science major at the North Philadelphia university, posted a petition online this week that asks Mayor Jim Kenney and City Council to rename Taney Street, named after the late U.S. Supreme Court Justice Roger B. Taney. As Basile notes in a letter addressed to city officials and council members, Taney penned the majority decision in the 1857 case Dred Scott v. Sandford, affirming that slave owners had the right to take their slaves into what was then the Western territories. But the decision is typically remembered for the court's opinion that African Americans could not be citizens because they were considered inferior when the United States Constitution was drafted in 1787. "Every constitutional law class teaches you about Dred Scott and how in the legal world it's colloquially one of the worst decisions in American legal history," Basile told PhillyVoice Friday. "We shouldn't be naming a street after somebody who considered African Americans property." Instead of continuing to "revere" Taney, Basile recommended city officials rename the street after a noteworthy former Taney Street Little League player. 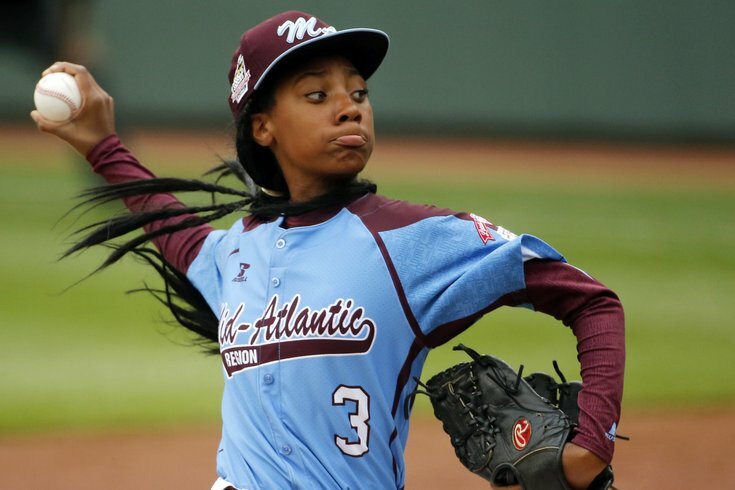 "A figure who is worth our reverence is Mo'Ne Davis, Little League Baseball legend and first female game-winning pitcher in the little League World Series," Basile wrote. You may remember a 13-year-old Davis and her devastating curveball spearheading the Taney Dragons' championship-game run in the 2014 Little League World Series, making the Philly native an instant national celebrity. "All of us watched as Davis made quick work of opposing teams and forged her path into the history books and into the hearts of Americans everywhere," Basile wrote. Kenney emailed Basile Friday evening, saying he is "supportive of changing the name." He encouraged Basile to reach out directly to City Council, which would first have to introduce and approve an ordinance on the matter. Basile told PhillyVoice Friday that he had knocked around the idea for about a month, but that the deadly clash of a white nationalist rally and counterprotesters in Charlottesville, Virginia last week spurred him to write and post the petition this week. He also pointed to Councilwoman Helen Gym's call this week to remove the statue memorializing former mayor and police commissioner Frank Rizzo outside the Municipal Services Building at 15th Street and JFK Boulevard, across from City Hall. "I figured council members are probably more apt to renaming streets now than ever before," Basile said. The petition had about 150 supporters Friday evening, besting Basile's initial goal of 100. He now hopes to reach 1,000 as he requests council to draw up and ultimately pass an ordinance. Crews in Annapolis worked Thursday night into early Friday morning to remove a statue of the Maryland-raised Taney from its perch of 145 years. The move came amid a national push to rename streets and remove monuments honoring Confederate figures in response to what took place in Charlottesville. Renaming streets isn't new to Philadelphia in 2017, either. Under far different circumstances, the city renamed Broad Street, from Christian to Carpenter Streets, "Boyz II Men Boulevard" after the R&B group in June. In May, the city also renamed a portion of 11th Street in South Philadelphia "Ed Snider Way," after the late Philadelphia Flyers owner and Comcast Spectacor Chairman. The city made another notable change in 1987 when it renamed the former Columbia Avenue to Cecil B. Moore Avenue in 1987. The North Philadelphia street continues to memorialize the civil rights activist credited with helping to quell a racially charged riot that centered around the road in 1964.